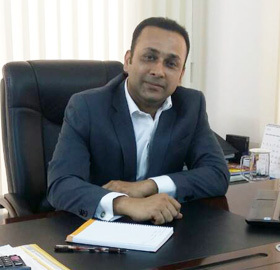 Founder’s Message – VFS Thread Dyeing Ltd.
Mr. M. Azhar Rahman, Managing Director of the Company is a professional and dynamic business person having above 15 years of business experience in different business. He was born in 1974 in a sophisticated business family in Dhaka. He completed his Masters in Business Administration (MBA) from University of North London, UK and then he engages himself into business. His interpersonal skills, leadership behavior, high analytical ability and hard working nature made him worth as a business leader in a short period. During his tenure of business career, he gained business knowledge in textiles, yarn dyeing, agro based and readymade garment industries. He also traveled many countries including UK, USA, Europe, Hong Kong, China, and India etc. for gaining technical know-how on different business and latest development of textile & dyeing technologies. He is also associated with different social and humanitarian activities.